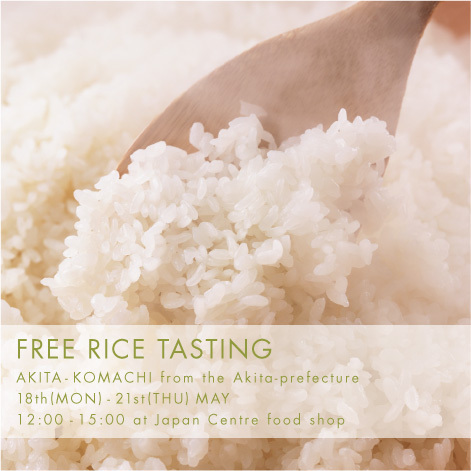 A rice tasting event may sound strange to our Western customers, but all Japanese know that getting the best tasting rice is the basis to success in the kitchen. So get involved and come to the Japan Centre Food Shop from Mon 18th – Thurs 21st May between 12-3pm to try our newest import. Akita Komachi is one of the most popular varieties of rice among Japanese people. Unlike many other types of rice, this brand of Akita-komachi is actually made in Japan in the rural location of Akita in northern Honshu (the main island). It is sticky and chewy in texture, but is also firm and moist making it ideal for a wide range of dishes from sushi to curry. Japan Centre’s importing of this rice has even made the news in the local newspaper in Akita, click on the picture below to see the whole article (Japanese only). Kodo – Taiko Drumming in London – Competition!